This inscription from an ancient Egyptian papyrus inspired the title of a new book, The Tears of Re, a historical look at beekeeping in ancient Egyptian culture by Professor Gene Kritsky, an entomologist at Mount St Joseph’s University. Egyptians used honey as a sweetener in their cuisine and it was also used as a medicine. Scholars also confirm honey’s centrality to Egyptian society by measuring its worth relative to other objects and commodities. Only the higher classes and parts of the royal court would have enjoyed honey, Kritsky says, which clearly tells us something. Honey was also used as a kind of tribute from the various provinces to the Pharaoh. Ancient Egyptian bee hives were different from the kind of hives used by beekeepers today. Tomb paintings show beekeepers removing round honeycomb from the horizontal hives. The honeycomb was crushed and then placed into containers. Another relief shows beekeepers holding a vessel with a spout coming from the middle or towards the bottom, Kritsky says — much like a fat separator used for making gravy. “That may be one way they could have decanted a lot of the honey without getting a lot of the wax mixed in with it,” he explains. In one of the oldest tomb paintings, from 2450 BCE, a beekeeper is holding something to his face, right up against the opening of the hive. Egyptians had various uses for beeswax, too. Beeswax was used in cosmetics, as well as in paintings, and even in some embalming practices. The Argentine ant, already known as one of the world’s most widespread and damaging pests, may be infecting honeybees with a deadly virus, a new study finds. Alexandra Sebastien, a biologist at Victoria University of Wellington in New Zealand, analyzed Argentine ant populations in New Zealand, Australia and Argentina as part of her doctoral research. She and her colleagues found that ants from all three locations can carry the deformed wing virus, a pathogen linked to colony collapse in honeybees. The new study appears in the current issue of the journal Biology Letters. Argentine ants have flexible diets that allow them to thrive in many climates and on multiple continents. They eat other ants and insects, but also prey on larger animals like skinks and geckos. “These ants, when they establish in an area, they become very widespread and they forage in the same places as bees,” said Phil Lester, a biologist at Victoria University of Wellington and a co-author of the new study. 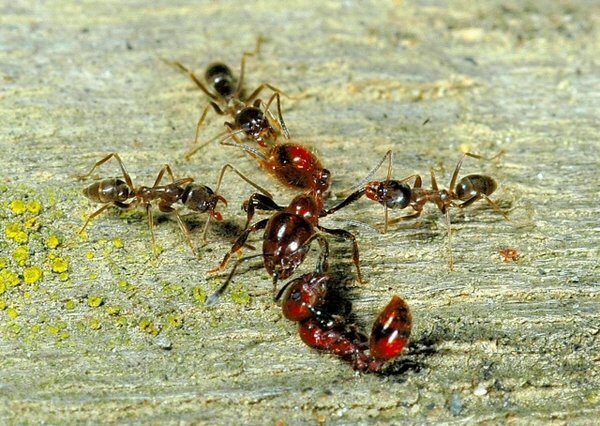 The researchers also discovered that some Argentine ants carry a second virus that could be useful in controlling the ants. “It could save us from utilizing large amounts of pesticides,” Dr. Lester said. Ugandan bee farmers have been urged to seek advice from entomology officers in their districts to help them in the bee-keeping projects. Entomology involves the studying insects scientifically. The call was made by an agriculture ministry official during the launch of the directorate of agricultural extension services at the ministry of agriculture, animal industry and fisheries in Entebbe. 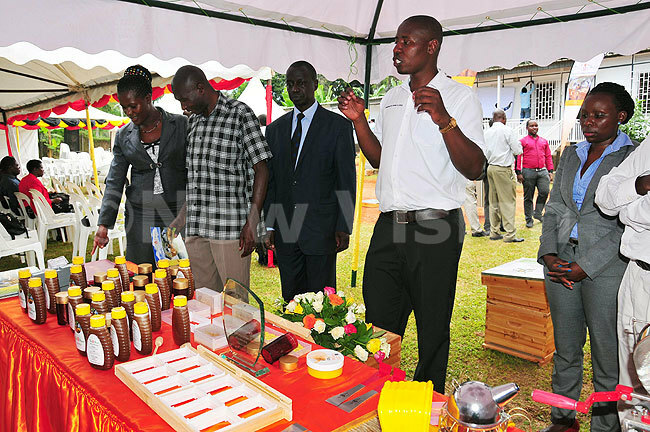 Vincent Rubarema, who is the permanent secretary at the institution, also said that ministry, through the new directorate, was partnering with organizations like The Hive to help in doubling honey production. In the modern bee-keeping, various equipment like the CAB hive, bee-keepers protective suit, beeswax, hive brand smoker, bee brush, uncapping forks, honey extractor and many others are used to help harvest honey – without killing bees or destroying combs. And for that reason, local bee farmers are being encouraged to shift away from the traditional way and adopt more modern techniques of the practice. 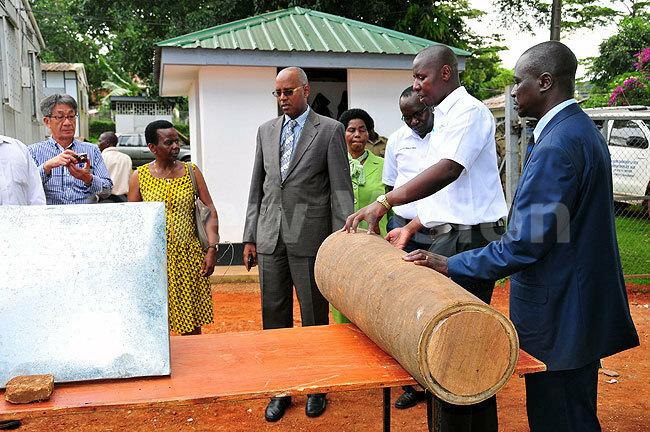 During the launch of the new directorate in Entebbe, the above mentioned items were on display. The new director, Beatrice Byarugaba, said bee farming should cover the whole country if Uganda is to meet the required amount of production. She said that currently, bee-keeping is booming in areas like West Nile region, Pader, Apac, Lira Mubende and Bushenyi. A while back, news that honey from Uganda had finally been certified for European markets was received with great optimism by local bee farmers. This would mean doubling the country’s current production of about 500,000 tonnes a year. Also in many homes across the country, due to health reasons, honey has replaced sugar when it comes to tea time. Unfortunately, with all such market opportunities, reports from the ministry indicate that the production for honey is still very low. One of the chief factors for this is farmers sticking to tradition ways of bee-keeping instead of using modern bee farming equipment. Christopher Nzuki, the chief executive of The Hive explains that a single CAB hive produces around nine to 13kg of honey per harvest compared to the tradition one which gives very little while at the same time destroys the colonies. He adds that with the modern equipment, harvest can be done six times in a year. “Traditional bee-keeping is wasteful and injures bees while the modern harvesting leaves enough honey for bees, and comb frames are put back for refill after honey is extracted,” explains Nzuki. He advises bee-keepers to increase their production, citing the high demand for not only honey but also its byproducts – which he reveals are even more expensive than honey. They include pollen used in the improvement of malnutrition, wax required in many industries for making soap, candles and many other things. Others are royal jerry which improves fertility and boosts immunity while also delaying the ageing of cells, while honey is sought by many for various health reasons. The Hive, an organization promoting bee-keeping, so far has branches in 12 countries around Africa including Uganda, Kenya, Tanzania, Rwanda, Ghana, Liberia, Senegal, Burkina Faso, and more. Meanwhile, Kelvin Odoobo, the managing director for The Hive, believes bee farming can also help farmers in bringing more life to their farms. He pointed out that bees are responsible for the pollination of about 80% of the crops that give us food. 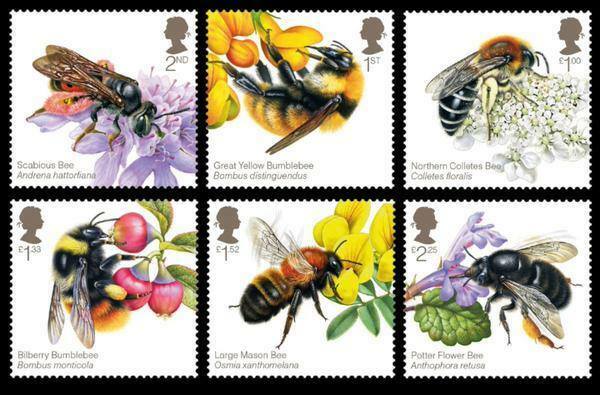 We think these new Royal Mail bee stamps are brilliant! Since May 2014, the British Beekeepers Association (the organisation behind Friends of the Honey Bee) has been working with the Royal Mail to produce a new range of stamps featuring bees and their lifestyle. They go on sale on August 18th, so keep a look out for them (and if sending us any post, remember to use your bee stamps!). 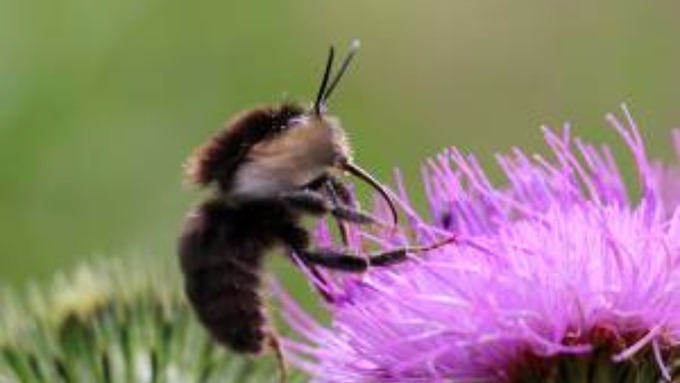 Visitors to Norfolk and Cambridgeshire can see Ruderal bumblebees on the reserve at WWT Welney Wetland Centre this summer – a species which is scarce in the UK. The bees are visiting the wildflowers on the reserve collecting nectar. At the same time, they are playing a vital role by pollinating the plants. Some members of this species lack the distinctive striping that is normally associated with these insects. Only three populations of this species were found in Norfolk between 2001-2011. Many bumblebee species have seen a worrying decline in numbers due to threats including changes to modern land uses and farming practices. ‘Ruderal bumblebees have a particularly long tongue, and so feed on flowers such as comfrey, yellow iris and marsh woundwort. They are also well adapted to feeding from red clover, teasel and thistles. ‘The wetlands we manage provide the plants these insects need to exist. You don’t have to look far; the swathes of wildflowers beside the footpaths are a favourite spot for the bees and many other pollinating insects’. Wardens say ruderal bumblebees will be out on the reserve for a few more weeks before the queens start to think about hibernating.